Having a baby is one of the most amazing and life-changing events you are likely to experience. As a mother-to-be, you start developing a bond with your baby from the moment you find out you are pregnant. Of course, one of the great parts about being pregnant is the baby shower your friends and family help plan. A baby shower is a wonderful way to celebrate the coming event and adding wedding sparklers will only add to the event and make it more memorable. Baby showers have traditionally been thought of as a way to celebrate the coming of a new life into the world and the joys of motherhood to come. Where once they were a surprise party thrown by friends and family, today more mothers plan their own. 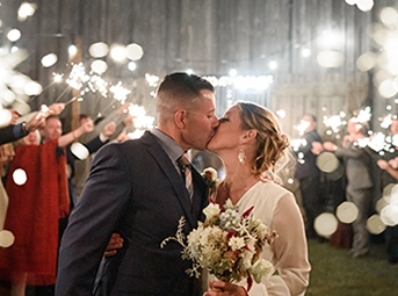 So, if you are going to throw your own baby shower, why not make it one to remember by adding wedding day sparklers for your guests at each place setting. Now that we have you thinking about using wedding sparklers as part of your baby shower, the next thing is to decide what size wedding day sparklers are going to be the best choice. These sparklers come in three different lengths, 10-inch, 20-inch, and 36-inch. Each length burns for a different time. The 10-inch weddings sparklers burn for approximately 45 seconds, the 20-inch for 1.5 to 2 minutes, and the 36-inch ones burn for 3.5 minutes. However, we recommend that you stick to the 10-inch sparklers as they only last 45 seconds, which is a much better choice for indoor use. If you are familiar with the types of sparklers kids are allowed to play with on the Fourth of July or New Year's Eve, you probably already know these sparklers put out tons of nasty smoke. This is why there are listed for outdoor use only. The wedding sparklers we sell at Wedding Sparklers Outlet are made for use outdoors or indoors, meaning that they are completely smoke-free, making them the best choice for your indoor baby shower. Like all forms of sparklers, our wedding day sparklers are completely harmless (as long as no one touches the hot metal while it is burning or just after). You should also be sure to have at least one or two buckets of water for your guests to place their spent sparklers in. This will cool them down instantly and help ensure nothing gets burned in your home. The wedding sparklers we offer at Wedding Sparklers Outlet are the perfect choice for your baby shower. Your guests are sure to have a blast lighting them and making crazy symbols in the air. They are a wonderful way for everyone to celebrate the coming of your new baby and your impending motherhood, even if you already have children. The best part is that you can allow your children (if you have others) to play with them under supervision and let them join in on the fun!